Thunderstorms threatened all Saturday morning at the 2003 Division II & III World Championship Finals at Orlando's Citrus Bowl Stadium. While it seemed fans and corps were about to be drenched at any moment, the storms only succeeded to offer up a small drizzle, while the far more threatening sound of thunder remained in the distance. For the first time ever, the II & III Finals was held the same day as the Division I Finals, allowing fans who got into town for the last day of the season to catch the other big show of the day. 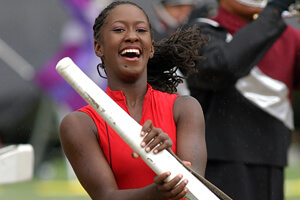 Competitively, Esperanza (Spanish for "hope") competed as part of the Drum Corps International Tour from 2000-2006. The corps, from the far southern California city of San Diego, stayed in California during their first summer season and most of their second. 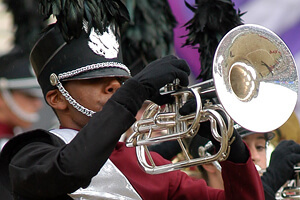 The corps didn't lose any shows in its division in 2003. While Esperanza dominated its fellow Division II & III California corps out west, its wins were not blowouts. When the corps went out east, it had to be satisfied with small spreads, such as a 0.10 win over Patriots in Erie, Pa. At the Division II & III Prelims in Orlando, the corps placed first, just 0.30 over Patriots and 0.60 over Spartans. Due to a massive rainstorm that cancelled the Semifinals, the top Prelims corps were seeded into Finals based on their Prelims placements. At the Finals, Esperanza beat Patriots by a scant 0.15 and Spartans by 1.15. "Reflections" was based on intriguing music from the late 20th Century. The music was often erudite and thought provoking, but not so much so that the audience couldn't appreciate the melodies. The show opened with corps members standing in two parallel lines diagonal to the front of the field. When they started to move, a short glimpse was offered of the opening fanfare from the hypnotically mesmerizing and rhythmically driving "Mishima," written by minimalist Philip Glass for a 1985 film of the same name. The film was based on the works of traditionalist post-World War II Japanese writer Yukio Mishima, who despised the country's modernism after the war. Next was a selection from Henryk Górecki's "Concerto for Harpsichord and Orchestra," based on the 1980 work by the contemporary Polish composer famed for exploring a deep spirituality with a unique minimalist style focused on simple-but-captivating profound melodies. This was perhaps his most playful work, a delightful romp that almost sounded like accompaniment to a horse race. Ennio Morricone's "You're Still You," sung by Josh Groban on his self-titled first album from 2001, introduced a little pop ballad flavor into the show. After a quick build, the volume of the corps dramatically increased during the standstill proclamation of the melody. The closer was Wynton Marsalis' "Jubal Step" from "All Rise," a 1999 massive work for orchestra, jazz ensemble and large choir that covered the gamut from jazz to classical and world music, all the time structured in an omnipresent 12-bar blues. "Jubal Step" is the first movement from the production, a rapturous celebration of birth. Marsalis stated that the theme of the piece was based on a riff his elderly great uncle sang to him when he was a young boy. Stylistically, the piece was a bubbling stew of ragtime, fiddle-inspired tunes, South American dance rhythms with samba drums (played by the bass drums set on the ground), and a march. After winning the Division II title in 2003, Esperanza moved into Division I competition in 2004 where the group stayed until its last season in 2006. For this week only, you can save on the World Championship DVD that contains this complete Esperanza performance, along with all finalists from the 2003 DCI Division II & III World Championships. Buy the 2003 Division II & III World Championship DVD. (Available this week only for 20% off. Regular price: $35.95.) Discount DVD offer ends Monday, June 17 at 8:30 a.m. ET.